Hi, i would like to lodge a complaint against your driver of feeder bus svc 883 from canberra st towards yishun. My wife and daughter who is above 0.9m and below 1.2m always take this bus to school. As my daughter is above 0.9m i have applied an ezlink for kids but she misplaced it and i have yet to replace it. So my wife have been paying 65c cash for my daughter every trip everyday to and from school which is just 3 bustops of travel as we know payment have to be made for child above 0.9m and she misplaced her ezlink which allow her to travel for free before age of 7yrs old. But to my surprise my wife told me today 22nd march 2018 at about 10.40am to 10.55am when she boarded the bus 883, my wife was told to pay adult fare for my daughter which is $1.40. Please justify the payment of $1.40 that my wife have made for my daughter. I am writing in response to your feedback concerning your wife and your child experience with our Bus Captain of Service 833 on 22 March. I acknowledge the concern you have raised, which have given rise to your feedback. Please allow me to clarify that all passengers are required to pay their fare via cash or H-Link card for their journey. In order for your child to enjoy child concession fare, the concession card must be carried as proof of eligibility and be shown to our Bus Captain. If the concession card is not available, you have to pay adult cash fare or use a valid adult stored value card. The minimum adult fare is $1.40. While we regret that this have given you cause for feedback, we trust the above is to your understanding. 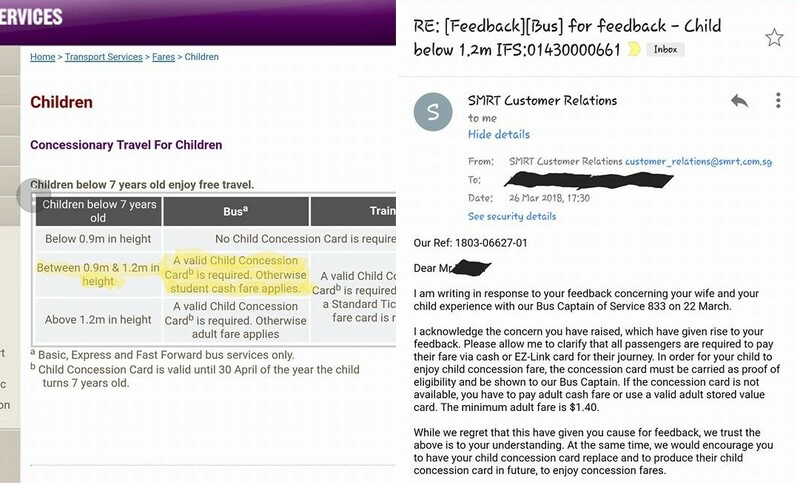 At the same time, we would encourage you to have your child concession card replace and to produce their child concession card in future, to enjoy concession fares. below 1.2m. Do you even understand that to pay adult cash fare the child need to be above 1.2m. My daughter is below 1.2m. Below 0.9m then it’s free. And i don’t mind paying 65cents for my daughter when she misplaced her child ezlink card but not $1.40 adult fare when she is still in preschool. Also if u think my daughter have a concession card she would need to be paying. She is below 7yrs old so it’s free even when she tap her card on the reader. Should i bring this up to lta instead to educate you and your bus captains?